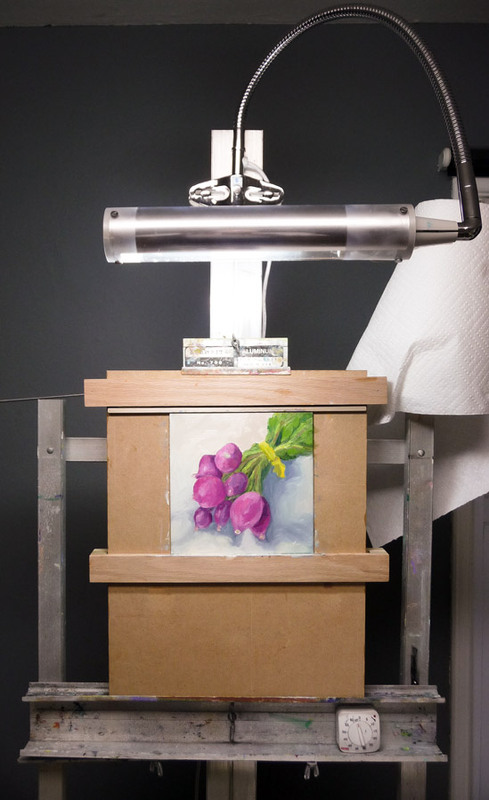 Two recent discoveries have made my painting life easier, brighter and more enjoyable: the new Daylight Artists Professional Lamp and a new prototype version of Karin Jurick’s tabletop easel that serves as a panel holder in a regular easel. First a disclaimer: I was given both of these items as samples to try out. I offered to write about them here with the condition that I would say exactly what I thought, whether positive or negative, no holds barred (whatever that means… something to do with wrestling perhaps? So funny how sports terms have infiltrated non-sports language). A London representative from the Daylight Company emailed me, saying that he had read my article about lighting and color temperature after being referred to me by another artist/blogger, Erin Hill, who they’d featured on their website. He asked if they could feature me next, and I agreed (see my “feature” here). 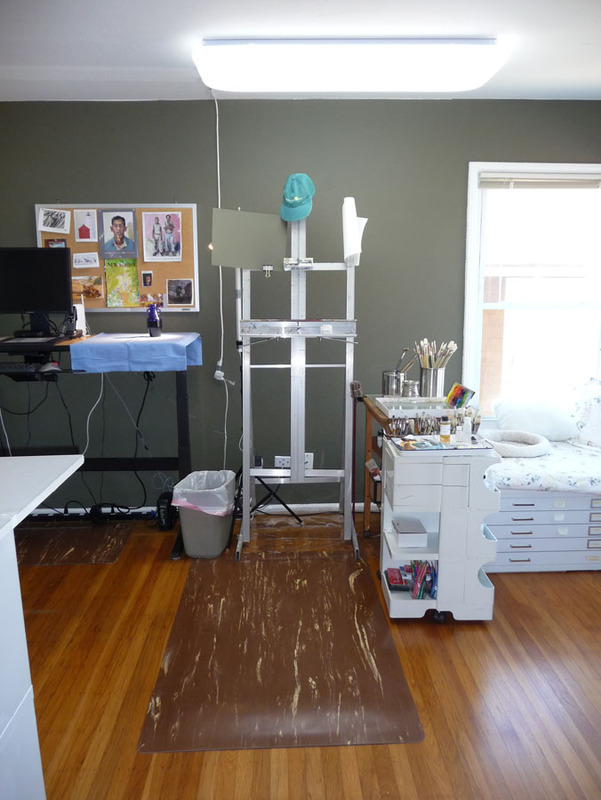 I told him I’d been using their Combo Lamps at my watercolor table for many years and love them (see them in use in my studio–6th picture here). When he generously offered to send me their new Professional Artists Lamp (above) to try out I was appreciative but skeptical. I’d bought and returned many other “full spectrum” or “daylight bulb” lamps in the past that were total failures because the light was too weak, too blue, or both. When I set it up on my easel and turned it on I was surprised and excited. I thought my lighting had been really great: an overhead fluorescent fixture with four 5000K bulbs (8th photo down in studio pictures here.) But the difference is amazing. In comparison it felt like I’d been practically working in the dark before. The first painting I completed under the light sold immediately and I think it’s partly due to the color vibrancy the light helped me achieve. 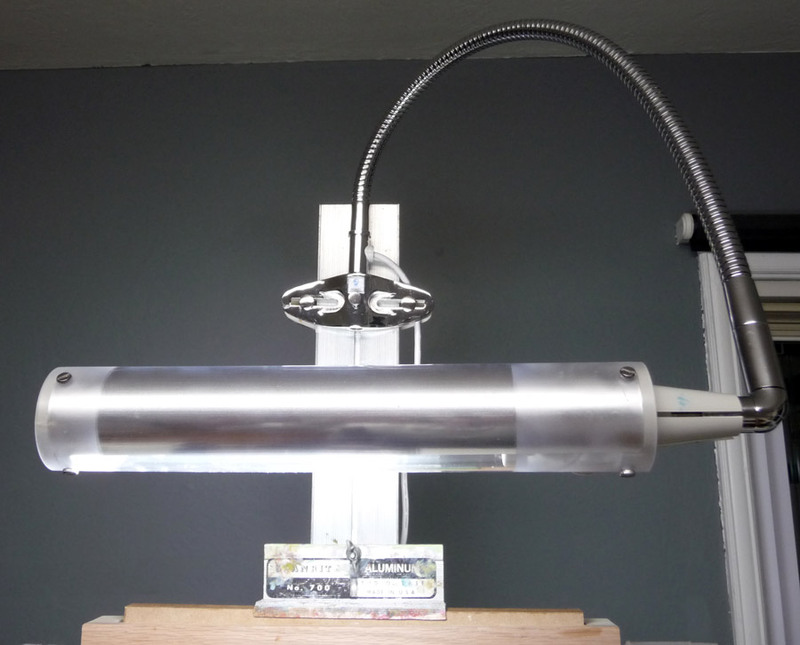 The direction of the light and the position of the lamp are adjustable (the arm is flexible but firm). It comes with a table clamp and an adjustable easel clamp. I was worried there would be too much glare on a wet oil painting from the lamp but it hasn’t been a problem. The light seems to evenly cover the paintings that I’ve tried it with (up to about 18×24) and it’s helped when photographing paintings on the easel too. When I bought one of Karin Jurick’s tabletop easels, it was with the idea that I would use it initially as a panel holder thinking it would fit in my easel as sold and as a table easel for times I don’t want to stand to paint as I usually do. I can’t paint sitting at my easel because I have a large, thick, floor mat in front of it. 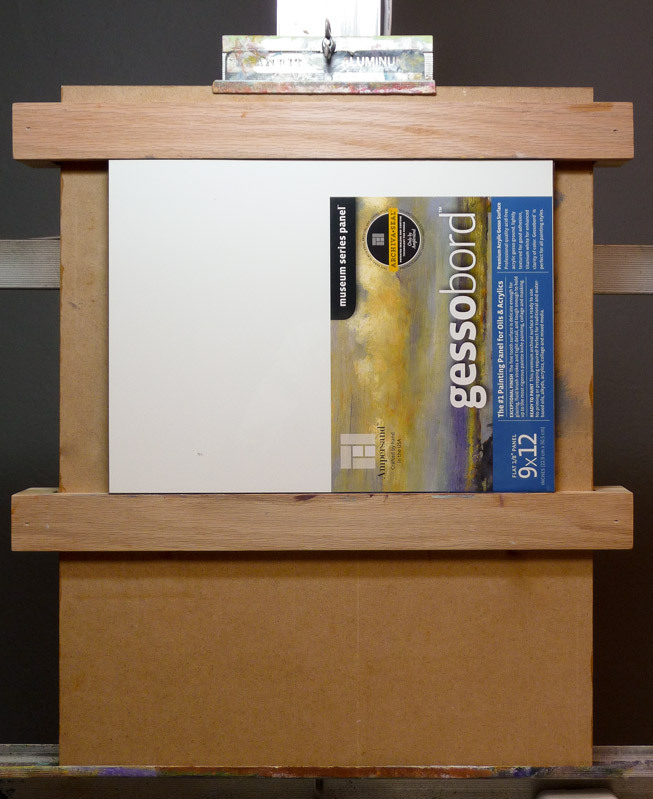 I wanted a panel holder because it’s hard to get my favorite 1/8″ Gessobord panels to fit into my aluminum easel designed to hold stretched canvas. I’d tried Carol Marine’s panel holder, but it only works for panels up to 6″ high and I rarely work that small (her new one goes up to 8″ high). Unfortunately, even though it folds nearly flat, it wouldn’t fit in my easel (my sense of spatial relations is terrible–I don’t know how I thought it would!). So I wrote to Karin and her partner Brett to ask about dismantling it to use as a panel holder. Brett liked my panel holder idea and offered to experiment with making one instead. I was delighted! Their standard easel comes with a permanent wooden ridge at the bottom and a sliding brace that locks in the panel from above with thumbscrews on the back. For my prototype, I asked to have a sliding bar at top and bottom so that I could scoot the bottom bar up to adjust the vertical position of the panel. I love it! It works really well and I’m so happy not having to try to line up and wedge the 1/8″ panel between the narrow edges of my aluminum easel. The sliding braces are designed to support all thicknesses of panels or stretched canvas. I use very thin 1/8″ Gessobord panels so the sliding bar was thicker than my panel. Since my lighting comes from above, that was casting a small shadow at the top of my panel. I easily resolved that by placing a same-sized piece of foam core board behind the panel to fill the gap. Voila! No shadow, and my Gessobord is held tighltly in place and I can paint all the way to the edge of the panel. Both the tabletop easel and the panel holder are nicely constructed, sturdy, and work very well. You can get all the details about the tabletop easel here. The panel holder is nearly identical except that it doesn’t have the base (and in my case, has two sliding braces instead of one fixed and one sliding). If you painting on panels of any size, I highly recommend their panel holder. Since this is a brand new product, they haven’t set the price or shipping cost yet, but Karin and Brett would love to hear from you if you are interested or have questions. You can email them at kjurick@mac.com. Great information! How fun to be asked to try these things out!! !